A dubSteps debut! We like to blood the new boys in pre-season. Then again, our author today has made several appearances in these pages before. When I write about things I have discussed with, or have been said by, a Mr Ketchup, I am referring to m’ very good Hawk chum Mark Cooper. Now, for the first time, without misrepresentation by me, you get Mr Ketchup in the raw. Enjoy. Having booked what has become an annual trip to Scotland for the week following the end of the Conference South season, safe in the knowledge that the Hawks were out of play-off contention (we booked this back in February). Mind you, I missed our play off first leg against Braintree two seasons ago and last season there was always the chance that we would succeed in our late charge for the top five with booked onto the sleeper coming home from Inverness on play-off final evening. As such, I was determined to find some football to watch whilst on our travels this time. Having scoured various Scottish non-league websites I was beginning the despair, but thankfully the much maligned (and rightly so) Setanta came to my rescue. Whilst watching their news channel, the rolling ticker revealed that yet again they were messing around with the fixture list and had moved the last Edinburgh derby of the season to the traditional football evening of Thursday. The Thursday we were in Edinburgh. Result. The only thing now was to persuade my long suffering wife that this would be a cracking way to spend the last evening of our break. After a lot of hard work and no little help from various people in the tourist information office and the Hearts club shop, she was finally won over and two £30 seats in the Wheatfield stand were purchased. Tynecastle is situated in the Grogie area of Auld Reekie, a thirty minute walk to the south west of the city centre, trying not to look too much like a tourist. I’d sussed out the route and fortunately we soon spotted people wearing colours who seem to be heading the same way to we found the ground without too much trouble. 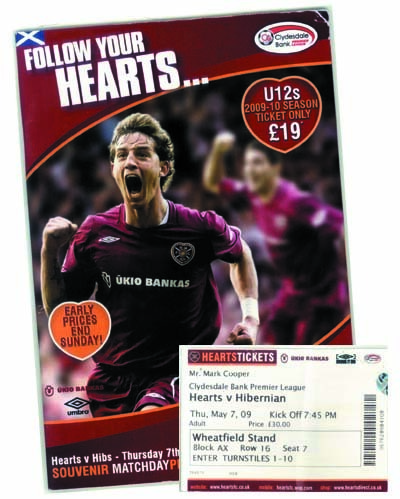 Tynecastle’s record crowd is 53,000, obviously this was pre-Taylor and apparently it was a pretty basic ground with a main stand, a standing paddock in front and three sides of open terracing. The three open sides have now been replaced by three identical all-seat stands, the most noticeable thing was the rake of the seats, and without doubt the steepest stand I have ever been in. The advantage of this being that the view is superb. I must now confess that I have always had a soft spot for Hibs, mainly because I always, as a child, had a keen interest in football shirts. Arsenal shirts in green and white were certainly that. As we entered the ground the thing that struck me was the noise, and it was LOUD, and without the use of an annoying tannoy to try to whip things up either. I doubt this game needs that. As the teams were read out the Hearts fans were particularly keen to let the Hibs centre-forward Derek Riordan have a welcome. The game got underway with Hearts dominating the early exchanges but the Hibs keeper, the marvellously named Yves Ma-Kalamby, kept them out. Yves was on the end of some banter as he had by all accounts gifted Hearts a win at Easter Road in the Scottish Cup earlier in the season and at times seemed to want to do the same thing again with some hairy penalty area dribbling and some ‘interesting’ clearances. However, Hearts couldn’t make the breakthrough and Hibs, who were missing 10 first choice players, started to grow in confidence and could have taken the lead through the much abused Riordan, whose run and curling shot brought the save of the game from Marian Kello in the Hearts goal. It was not really a surprise that half time was reached goalless as Hearts had decided that they were going to play like a Conference South side for the evening. I don’t wish to be hyper critical but surely players in the country’s Premier division should be able to trap the ball as Hearts’ Bruno Aguiar failed to do on no less than three occasions, and he was one of their better players. The full back Eggert Jonsson lasted 33 minutes before he was hooked off. The second half continued in the same vain for the home team, but Hibs worked out that the game was there for the taking and looked the most likely scorers, attacking the end where their 1500 or so fans were gathered. These fans had been singing when we got into the ground at 7:25 and were still going strong 15 minutes after the final whistle. They didn’t bother stopping at half time either. They got the winner with 12 minutes to go when much to the chagrin of the home fans Riordan got through on goal and was brought down by Karipidis, one of the Hearts’ Lithuanian contingent, a penalty was awarded and Karipidis tunnelled. Riordan stepped up and sent Kello the wrong way. 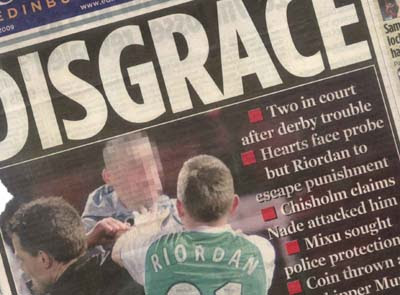 Then it all started, having given his own fans a wave, Riordan then headed for the stand we were in and gave the Jambo’s the finger over the lip. Three Hearts fans got onto the pitch to discuss things with him. Two were grabbed before they got him, but the other managed to land one on the ref who was trying to get the miscreant Hibee away to restart the game. The local paper went to town on them the following morning. I’m surprised the Hearts fans saw this as such a crime as going back to the late 80’s/early 90’s they gave hero status to a signing they made from England who did the same thing having grabbed the winner at Easter Road. Then again, Ian Baird never did have any class.